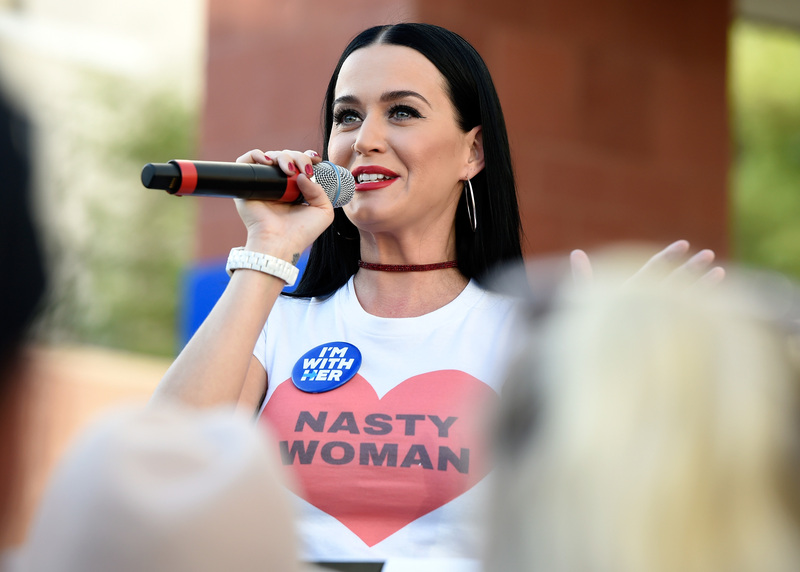 Katy Perry has been one of Hillary Clinton's biggest celebrity supporters in the 2016 presidential election, and for Halloween, she showed her support in a way the democratic presidential nominee was not so sure about. When Extra showed the candidate a picture of Katy Perry's Hillary Clinton costume, the real Clinton responded appropriately with the words "Oh, my — look at that! This is shocking — oh, my gosh." Jennifer Lopez, who was also at the interview, was equally shocked. You can't really blame them. Perry fully committed to her costume, with facial prosthetics and everything. The effect is a little... spooky, not to mention the similarly realistic Bill Clinton at Perry's side. The man is Perry's friend and agent Michael Kives Perry, and if you're wondering where Perry's boyfriend Orlando Bloom was during all this, that's him in the even more terrifying Trump parody costume. Bloom, Perry, and some of their friends attended Kate Hudson's Halloween party in the election 2016-themed group costume. Also in attendance was Kendall Jenner, who twerked on Perry/Clinton. As Perry said in the Snapchat video, "if you've got the Kardashians, you've got the vote." Perry has been actively campaigning for Hillary Clinton since the very beginning of her candidacy. The 32-year-old pop singer has taken many selfies with the candidate, helped fundraise, taken a naked selfie to encourage voters, gifted Clinton some pretty badass jewelry, and performed and spoke at the Democratic National Convention. "I didn’t finish high school and unfortunately I don’t have a formal education," she said at the July event. "But I do have an open mind and I have a voice." It makes sense why Perry would use Halloween to express her support for her favorite candidate, even if that support wasn't 100% appreciated. Perry's clearly a pretty big fan of the holiday, and she does it up every year. While most would call it a Halloween after donning a costume that intense, Perry hosted an entire 50s-themed birthday party the very next day. The birthday girl wore an impressive updo, and the party featured a giant Twister game and some Elvis and Marilyn impersonators. Kinda puts your Halloweekend to shame, doesn't it?